Carebase’s latest home in Chelmsford has opened its doors ready for the seasonal celebrations. The 66 bedroom home proudly replaces a hotel on the site, incorporating rebuilding of the original villa facade. The three storey home has been designed to accommodate differing user groups on each floor, creating full independent living, supplemented by classy traditional style interiors with a modern twist. Set within a conservation area, the home achieves a BREEAM very good rating. 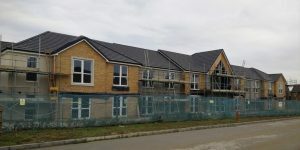 Works are progressing well on a new build 45 bedroom care home at PINNER for Vivo Medical Care Ltd. The scheme was originally designed by DWA Architects, with Ward Associates Project Services providing Project Management, Employer’s Agent and Cost Consultant services. Works are anticipated to complete in early August 2017, in line with the original programme. Above left image indicates current progress on site, whilst above right provides a 3D visualisation of the home as it will appear on completion. Heathfield Court for Carebase nears completion, with CQC inspection to be undertaken in April. The 66 bed care home cleverly utilises a mansard roof and basement construction to maximise usable space & facilities within a residential area. 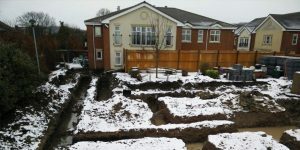 The first DWA designed care home for Glenhome Group has started on site. The 64 bed home is being constructed by Goldfinch and is due for completion in June 2018.